The British public were first made aware of Dorah's plight in an article by Bronwen Jones which appeared in The Times on 16th December 1997. That article appears below, followed by an updated article published in The Times on 3rd February 1988 and another published on 15th December 1998. The latest article dates from 30th November 1999.
Who will save this child? South African doctors can't save Dorah's eyes. Perhaps their British counterparts can. Bronwen Jones appeals urgently for help. I have a friend called Dorah. They want to cut her eyes out. I know of only one way to save her from this terrible pain and loss, and that is to achieve worldwide levels of publicity that an injured child has never known. And to hope that some super-surgeon will be reached by that publicity and step in before it is too late. Dorah lives in South Africa. The child of a child, she and her mother lived in a squatter camp with a blind grandmother and an alcoholic uncle. One day the shack called home caught fire. The seven-month-old baby struggled to breathe amid the flames and pushed fiery timbers away as they fell on her face. The heat burnt off her hands. I have tried to write about Dorah before, with limited success. Many local publications react as though disabled children are another species and barely, rarely, worth a mention. Whether harmed by biology or poor parenting, they are seen as a distasteful subject. "Not our kind of story" echoes in my ears. I have been visiting the hospital where Dorah lived for a long time. Week after week I witnessed the children poisoned by paraffin, hit by cars and caught beneath the fallen security gates that fence so many South African homes. Some had eaten poisoned berries or mushrooms, or been severely scalded as boiling pots of water fell from the stove. There were infants with pneumonia and two-year-olds with diarrhoea so bad that they might die. And the parents who bothered to visit left me unconvinced that they would care for their children more wisely once - or if - they returned home. One father stood there, clothes torn and filthy, making jokes about "tying a knot in it". He had a babe in the pushchair, another was being held in his wife's arms and two blonde toddlers - who had been burnt from shoulder to knee - lying in hospital cots. All four children were under the age of five. More chastening still were the abandoned ones. The beaming, perfectly healthy baby boy whose mother had died of tuberculosis - no relative ever came to claim her son. 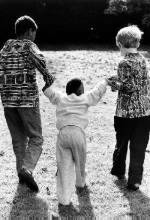 The Zulu-speaking five-year-old who went blind after meningitis. The family who brought her in never returned. She lay there asking: "When is Mama coming? Why is she taking so long?" No one answered her. One day I was walking in the ward and I saw a big boy crying. He looked at least ten years old. The nurses - caring, but too busy to do more than the rudimentaries - said "Oh, that's Wilson. He was hit by a car and he's not quite right." They tapped the side of their heads. I was handing out books when Wilson called me. "Come here, please," he said. I walked to his bed. "Hug me, please," he said. I did. Then he said "Now turn round, please". When I did, he gently put his arms around my neck and his legs around my waist. As he clambered on to my back, Wilson said "Take me away, please". But I didn't. I couldn't. If I were to try to help one of them, which one would I choose? Well, it would have to be Dorah. The ugliest duckling, the most beautiful swan. If you met Dorah, you would be scared. Or cry. Or think that she's too awful to look at. But she's not. She just doesn't have a face. Dorah wasn't born like that. She was born bonny. By character she still is. They didn't want to treat her at Baragwanath, the biggest hospital in the southern hemisphere, because they were so sure she would die. But Dorah is still alive and kicking. She has been fighting for survival against all the odds. A charred bundle delivered to the Far East Rand Hospital, no one but the little girl herself had faith that she could live. It costs R500 a month (about £63 - or a month's wages here for a cleaner) to buy dressings for what is left of Dorah's eyes. She has a trust fund and there is some money to contribute to operations. But the wisdom, economic and medical, is to cut Dorah's eyes out. Rob Dow, chief executive of African Merchant Bank and a Scot by birth, this week has offered to help to fund the cost of a carer for Dorah. "We are touched by her plight and want to help." Plastic surgeons have studied her photographs. Dorah's case has been discussed on the Internet. And while they think that they can make her an aesthetically pleasing false nose and eventually imitate muscle to give her fake lips that will allow her a better range of speech, everyone has given up on the eyes. Dr Leonard Pott, an anaesthetist and one of the medical specialists involved in Dorah's case, supports the removal of her eyes for medical and logistical reasons. To some extent the problem is money, he concedes, but his main concern is that the home where Dorah lives does not have the staff to spend more than an hour a day dealing with her dressings. The staff are unhappy at the pain Dorah suffers when the dressings are changed. "The problem with the dressing necessary to keep the eyes moist is that some sort of adhesive has to be attached to the skin," says Dr Pott. "It is airtight, it pulls, it hurts to take it off and it itches to leave it on. It has to be on quite tight as the area is a high-risk site of infection. Dorah has already had low-grade infections in the area." Dorah had no eyelids, and attempts to make some flaps from her skin to do the same job have so far failed because there was not enough tissue. The skin that remains on the surrounding area is scar tissue and has little blood flow. "They would need to move the skin with its artery; it needs a pedicle, or root," Dr Pott explains. "The skin of the eyelid is fed with blood from the top. It would die off without a blood supply. It also needs to be able to open and close." If a way could be found to reconstruct Dorah's eyelids, it would be possible to give her a corneal transplant. "If you can get help for Dorah from overseas, we would look at other options," says Dr Pott. "If anyone in Europe knows of appropriate artificial means to construct eyelids, we would like to know. We have models, photographs that we could send to them. "Dorah has plenty of personality. She has a lovely character. She was neglected for quite a long time but then she was given intensive occupational therapy. Initially there was a big surge of improvement, but this was not sustained. There are strong reasons to take Dorah's eyes out. If we're wrong, we'll stand corrected. We don't know what else to do." Yet if you play with Dorah you know that she uses her eyes. She shades them from the sun, or from candle flames at Christmas. Light and dark are a part of her world and she uses what is left of her sense of sight to understand and learn. By most definitions, Dorah is blind. But if any one of us had a choice between knowing whether it was night or day, or being plunged into permanent darkness, we would certainly opt for the former. I took a radio journalist to Dorah's third birthday party and her sweet laugh was heard across South Africa's airwaves. But I cannot take a television crew because viewers are too accustomed to the Barbie-doll-cute to cope with Dorah. But I wish they would. Because for a little girl who can hear, taste, touch, smell and sing, the shades of light and dark are as vital as all the other senses for her vision of the world. The lack of a nose has not removed her ability to sense smells. Take away her eyes, and this child will be in the dark for ever. I do not believe she can afford to lose even one sense as she grows into her uncertain future. Everywhere in the world, the abled and the disabled are kept apart. And in South Africa there are so many calls on state time and money that a child like Dorah is considered lucky just to get tender loving care. There is no money for a dedicated therapist to stimulate her senses. Dorah now lives among mentally disabled children in a Catholic institution. She is as bright as a button. She loves music and tickles and running blades of grass between her toes. With a little help, Dorah can catch a ball and play pony by riding on the back of another child. She likes to slide and to swing, to stroke a dog or feel the strange shape of a fir-cone. Linking cause and effect, she pushes the keys of an electronic keyboard and sings the notes. Wider keys would suit her stumps better. Bronwen Jones has been overwhelmed by the response of Times readers to an appeal to save a South African child's eyes. Dorah will be four in April. When she was seven months old, the shack in which she lived caught fire. The heat destroyed her hands and face. At the end of 1997 doctors in South Africa recommended that her eyes should be removed to ward off infection. Was this necessary? asked the The Times. Was there a surgeon somewhere who could save Dorah's eyes? Today, thanks to the generosity of our readers, Dorah has a very different future. The plea for medical assistance to allow her to keep her sense of light and dark has attracted interest from many eminent doctors. It has also raised £76,000 in donations - people wrote from as far afield as Australia and New York. The most likely option now is that Dorah will come to London in the spring and that the first of several operations will take place to rebuild her eyelids. Richard Collin, a consultant surgeon at Moorfields Eye Hospital, has offered his skills for free, and the hospital fees of £6,500 for the first two operations will be met by donations. Mr Collin has yet to examine Dorah, but he was optimistic after Sky TV shot medical footage of her injuries. If the initial assessment on Dorah is good, she will have the first operation immediately. This will use skin from elsewhere on her body, probably her legs, to create a curtain over the eyes. She will be in hospital for 10 days, followed by six weeks' convalescence to allow the scars to heal. During this time Dorah's eyes could be tested to see how much sight she has. Many Times readers have offered Dorah accommodation, but she may need to remain in London to have her other needs assessed at Great Ormond Street Hospital for Children, or possibly East Grinstead, where the Victoria Hospital has a specialised unit in plastic surgery. The second operation, to divide her new eyelids, would take two to three days in hospital. Then Dorah would fly home to South Africa for six months. Her scar tissue would heal and she would have daily treatment with eye drops and cream. After this, she would return to the UK for a third operation to try to raise the eyelids by attaching a muscle from behind the eyes to the lids. In this, or a fourth operation, Mr Collin would try to thicken the eyelids by adding tissue and more skin. Because Dorah's case is so unusual, none of the procedures or time estimates will be confirmed until she arrives here, and securing permission for her to travel involves much red tape in South Africa. Events took an even more unexpected turn when I found Dorah's mother, Margaret Mokoena, living in a squatter camp. I had been told by hospital administrators and by a reporter who had allegedly visited the camp that Margaret was only 14 when Dorah was born. When I finally met her, I realised that one never knows the truth until one has ascertained it for oneself. Margaret is now 26. She left school with the education level of a 12-year-old because there was no money to pay for fees, uniform and transport. She grew up in a dysfunctional home, with a drunken father who abused her mother so badly that she walked out seven years ago. Margaret has not heard from her since. Her father's other wife stabbed Margaret's father in the chest a year ago - he died. Margaret was raised mainly by her frail grandmother, Violet, on whose monthly state pension of R 470 (£53) the family survived. Margaret said that if ever she secured part-time work tilling the maize fields, the men in the family spent her earnings on alcohol. Even Dorah's father - who has shown no interest in her since she was injured - beat Margaret. She has burn scars on her right arm where he hit her with an iron. From this horrific background a quietly spoken, thoughtful young woman has emerged. Unlike many of her contemporaries, she has had only one child and has no intention of finding another male partner. She has no positive role models to encourage her to do so. How she lost contact with her child is a story steeped in the attitudes of the apartheid era that still affect so much of South African society. Margaret has little self-confidence; she curtseyed when we met. The blaze in which Dorah was injured started when a candle fell from its holder. The cardboard used to insulate the hut quickly caught fire. Margaret was at a neighbour's home fetching water for Violet, who was sick. "I came back and flames were coming through the roof," she whispers. "I looked inside and when the flames seemed lower over the bed, my brother and I grabbed the mattress and pulled Dorah out. She was so badly hurt that I was scared to touch her." An ambulance tour of hospitals followed through the night, with rejection and referral at every turn. When eventually Dorah was taken into the intensive care unit of the Far East Rand Hospital, Margaret was told to go home. She had been separated from her baby before, when Dorah was born two months premature. "I think it was because I was so badly beaten by my child's father. They kept her in an incubator for two weeks." Margaret was also used to being bullied by hospital officials, who always thought they knew best. She had neither the language skills nor confidence to argue with them. And she had no money. The visits were sporadic, but on one occasion she was told her child had been transferred and that no one could give her a contact number for the hospital. Margaret was told to go to the magistrate's court to sign papers to allow Dorah to become a ward of court, although she did not understand the terminology. "I did not go to court. But I did not know what to do. I had no money for lawyers." But Margaret understood that Dorah had been adopted and that her maternal rights had been removed. I took her to be reunited with Dorah. I cannot easily find words to express the feeling of the two of them being together again. This was not a bad mother who did not care about her child. It was a bad or indifferent society that did not try hard enough to keep them together. A society that looked at them in terms of what they could not do or did not have, and judged them thus. How wide can a smile be when a mother holds the child that she has been separated from for two years? 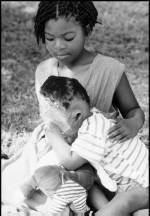 How soft can a look of contentment be as Dorah's arms wrap around her mother's neck and hold her tight? Lumps in the throat cannot convey the joy of seeing such an injustice righted at last. Of seeing Margaret cover Dorah's neck and ears with little kisses, cradling her, singing to her softly. I cannot pretend Dorah knew who her mother was. At the "handover" she clung to me - she knows my voice, my hair, my perfume. But I had at last used the words "your mother" when talking to her before the meeting. She knew I was the mother of her playmate Tristan. Now I told her that this was her mother. I believe that she understands. 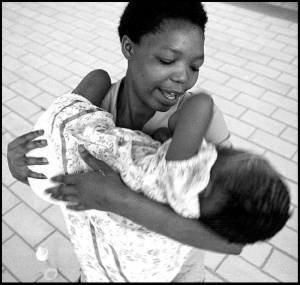 This reunion is only the first milestone on a long road for mother and child, but it is a remarkable one in South Africa. In addition to finding the best medical solution for Dorah, the task is to find the best and swiftest way to educate her mother to care for her. So when people asked what they could do, I requested early-childhood development videos, the easiest way to give information to barely literate nursing assistants in institutions such as the one in which Dorah lives. Some people asked if children could help. I suggested that they send toys specially tailored to Dorah's needs. Until now, Dorah has spent most of her life in a cot, and is far behind where she should be. But with the many hours that my son Tristan, 7, his friend Thobeka, also 7, and I have spent playing with Dorah, we have every belief that she is an intelligent child with much potential. One of the most exciting responses has been from Passmores School, in Harlow, Essex, where pupils are working on a frame from which scented and textured objects will hang. This will allow Dorah to smell a bag of herbs, or crackle a bag of Cellophane. They are also stitching a Dorah-size play rug that combines interesting textures, and are recording a story on tape that goes something like this: "One day Dorah went for a walk. The gravel path was rough on her feet" - they will glue gravel pieces on card for Margaret to place beneath Dorah's feet. "She found a flower in the garden. Its petals were soft like satin" - there will be satin ribbon for Dorah to feel. I still need to tell of the pensioners, the poet, the prisoner, the poor and the rich who reached into their pockets to help Dorah. A year ago The Times highlighted the plight of Dorah Mokoena, a four-year-old child with no face. She was all but blinded and left with appalling injuries by a fire at the family home in a South African township. There was an incredible response to her plight -readers donations enabled the child to be brought to Britain for treatment and surgeons offered their help for nothing. This week Dorah will undergo her sixteenth operation in this country. Much more of her sight has already been restored and the future is looking bright for the child who doctors once feared would never survive. In an attempt to ease Dorah's constant pain, surgeons in South Africa had been ready to remove her eyes - severely burnt in the blaze. Changing the dressings several times a day was agony for the child. It would have been yet another tragic twist to her sad story - a fire that almost killed her, separation from a mother deemed an unfit parent by the South African authorities and an early childhood scarred by a drunken and violent father. The Times appeal was to mark a dramatic turn in her fortunes. Thousands of people wrote with advice, with money. They reached out to her as if she were their own. Many specialists' names were suggested, but one ophthalmic surgeon was put forward again and again - Richard Collin, of Moorfields Eye Hospital in East London. Mr Collin, an acknowledged world leader in his field, agreed to try to operate on Dorah. First he needed to establish if surgery was a viable option - could Dorah be beyond hope? Sky TV flew out to South Africa and shot medical videos to show the staff at Moorfields the extent of the injuries. At the same time they introduced people in more than 40 countries to the infectious giggle of a seriously disfigured but still, extraordinarily, very happy little girl. To place Dorah's story in context, we went with a television crew to the vast Botleng squatter camp near Delmas, where she was born, and where she lost her face and hands in a fire in 1994. Against all expectation, we found Dorah's mother Margaret, who had been separated from her child for more than two years. In January this year, once we had verified Margaret's details, mother and child were reunited. At that stage, Dorah did not know her mother but I have never seen an expression to match the smile on Margaret's face that day. In February, Sizanani, the Catholic mission where Dorah and her mother were then living, helped us to overturn a court order and return Dorah to her mother's legal custody. In late March we flew to London - everybody was nervous. South African Airways wanted to know how Dorah would cope with the flight. We wanted to know how the public would cope with seeing Dorah. However, mother and child seemed entirely unfazed. Margaret was then a young, ill-educated woman who had barely traveled beyond her community. She was used to living in corrugated iron shacks with dirt floors, no running water and no electricity. She moved from the squatter camp to the carpeted, comfortable home of benefactors in a four-storey house in Fulham, southwest London. This pattern of generous-spirited Britons welcoming mother and child into their homes became the norm. The first operation followed soon afterwards and by the time that Dorah turned four on Easter Day her very limited sight had been saved. Mr Collin extracted rem-nant eyelids from within the skull and stitched them over the child's eyes. He covered the bare lids with supple skin from each side of Dorah's neck and then placed peep-holes in the lids to allow her to continue to receive visual stimulation. In a city full of such medical skill, there was no shortage of expert advice. Gradually, a team began to emerge: surgeons, junior doctors, nurses and advisers. It became clear that to give Dorah a quality of life worth living she needed a series of operations to rebuild her face. If cosmetic surgery was not carried out, she would grow increasingly disfigured. The poor-quality skin grafts performed in the past had no elasticity and most of the area between where Dorah's eyebrows are and her chin was not growing in proportion to the rest of her head. But how do you make new lips for a little girl who has none? She hasn't got lots of spare skin to take from elsewhere on her body. So, John Clarke, the burns consultant surgeon then at the Queen Mary's University Hospital in Roehampton, started the protracted process of growing a pedicle on Dorah's back. Cutting into one of the few areas on the little girl's body that was, until then, untouched, he formed folds of skin that looked like suit-case handles. Gradually these were lengthened into one long tube of skin and when that was growing healthily, it was detached at the tower end of her back, swung over her right shoulder and stitched on to her right cheek. We watched the peculiar progress of "sausage" into "chin strap" and eventually into Dorah's lower lip. The off-the-shoulder stage was difficult; the ring dough nut-like device on the side of Dorah's face was probably worst of all. That was to be the final stage before Mr Clarke and his team fashioned Dorah's upper lip. During the lip preparation period that was completed at the Chelsea and Westminster Hospital, work also began on Dorah's right arm. The stump was undone by the consultant David Martin, and with skin from her leg, a paddle-like hand was formed. Tomorrow, if Dorah's cold has cleared up, she faces her sixteenth operation since her arrival in Britain. Preliminary work will start to place plastic "formers" between the upper and lower lids on her best eye, to increase the space between her eyelids and the eye itself. A six-month operation-free period should follow before work begins to remove a cataract formed by the heat of the fire and then to give Dorah a corneal graft. As these painful and emotionally draining operations have continued, Dorah has been getting to know her mother again. And Margaret, in addition to learning mothering skills, has grown accustomed to life in Britain. The life changes experienced by these two young South Africans have been enormous. Dorah used to spend much of her life lying on her back, clad in a nappy and able to do almost nothing for herself. In less than a year she has learnt to walk; to articulate desires and emotions; to feed herself with a spoon and she is now continent. Therapists attribute the enormous leaps in development that Dorah has made to the security of loving family homes, to her mother being with her and to hearing only one language rather than the mix of 11 found in South African hospitals. Her mother is now learning to drive, enjoys kung fu training once a week, and attends private tutorials and school classes in English, current affairs and science. None of this would have happened but for the extraordinary generosity of readers of The Times and others willing to ease the suffering of a tiny child. There is a seasonal message here which should not be forgotten - there are so many Dorahs, so many who need our help. Meanwhile, two significant charities have been established - the Dorah Mokoena Charitable Trust in Britain and Children of Fire in South Africa. Together they will work towards helping Dorah and other children injured by fire to achieve optimum medical treatment. In this country schools and charities have already shown their willingness to help. Most recently, Nottingham teenagers began planning how they can visit South Africa and help other children who have suffered similar injuries. Why Dorah is such an inspiration Surgeons are still battling to improve life for little Dorah Mokoena, whose plight touched Times readers. Bronwen Jones reports. It was ten to four on a Monday afternoon when I first saw the colour of Dorah's eyes. An astonishingly rich chestnut brown, her right eye stared up through a microscope as surgeons worked to improve her sight. 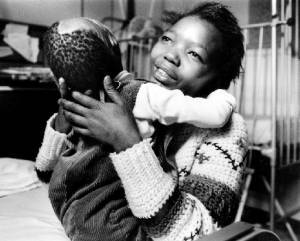 Dorah Mokoena, aged five, was horribly burnt in a shack fire in Botleng, South Africa, in 1994. In late 1997, when specialists in her home country decided to excise her eyes, claiming that she could not see and that it would be the only way of stopping continual pain, an appeal in The Times raised some money and prompted offers from surgeons who were prepared to help. Dorah, who two years earlier had been made a ward of court and put up for adoption, was reunited with her mother Margaret. Together they came to Britain for 17 operations in 1998 and early 1999. The cost was met by charity, and key medical personnel gave their skills for free. Dorah's lidless eyes now have lids; they do not open but there are peepholes through which she can see light and dark and make out some of the world around her. Her mouth now has lips, and she has a prosthetic nose moulded from plastic. After she returned to South Africa in February this year, Dorah and her mother started to attend Sibonile school for low-vision children. Dorah went as a pupil and Margaret began to train as an assistant teacher. Such aspirations for either of them would have met with ridicule a year earlier. Dorah celebrated her fifth birthday in the Highveld sunshine and has continued to flourish. With the aid of prostheses she can feed herself with porridge and can eat her favourite fruit, bananas, unaided. While Dorah continued to walk well with someone else holding her arm, at times we wondered if she would ever have enough balance and confidence to walk alone. In August, hugging her bright green dinosaur close to her chest, she took her first tentative steps without any support. It was a day of celebration, and a day when I again realised how much it would help if Dorah could see detail. When Richard Collin, consultant ophthalmic surgeon at Moorfields Eye Hospital, gave Dorah eyelids in London in April 1998, I thought I had achieved my quest. But as I came to understand more about plastic and ophthalmic surgery, it became clear that much more work needed to be done. Dorah's eyes had been saved and, through reconstruction work at the Chelsea & Westminster Hospital, conducted by consultant plastic surgeons John Clarke and David Martin, she had been given a more normal-looking face. As Dorah and her mother lived in my home this year, I watched what she could and couldn't do. In a familiar environment it was difficult to determine which sense she used to recognise a person or a place, but it became clear that she could see the difference in size between myself and her mother, and that she could differentiate between different brightly coloured large objects. We used a light blue plate and a bright red mug to help Dorah to use colour contrast to learn. Sometimes she would amuse herself, especially if sitting facing a window, by moving her arm back and forth rapidly to make a strobe-like effect with the light. We wanted Dorah to be able to see more, so a series of non-intrusive tests were carried out on her better, right eye to determine its structure and quality. It was decided that a corneal graft could be attempted, but first Professor Susan Lightman at Moorfields said that Dorah would have to take immuno-suppressant drugs to reduce the chance of her body rejecting the cornea. The decision was not taken lightly because of the potential side-effects of steroids on a little girl who is still growing. As we prepared for the operation we learnt that there was a chronic shortage of donated corneas in Britain. At the eleventh hour, a cornea was found, and on September 27 Dorah was again wheeled to the operating theatre at Moorfields. The operation was performed by Mr Collin, who opened and later closed the eyelids he had created. The graft was performed by consultant ophthalmic surgeon David Gartry, but as he removed the cataract caused by the heat of the fire, the news was disappointing. Dorah didn't have enough supporting structure to hold an artificial lens in place. However, this could be overcome by giving Dorah special glasses. After the operation Mr Collin stitched together the precious lids to keep the eyes moist and dust-free. People kept asking me "how much will she see after the operation?" and I never dared to say anything definite because there were too many variables involved. In late October, as Dorah recovered in Kent, she caught a devastating eye infection. Mr Gartry explained that the cornea had become too thin and perforated, almost as if it was melting. He said that the eye would ultimately shrink but that if the infection subsided it might still be possible to save the eye. Reluctantly he predicts that Dorah will lose the remaining sight in her right eye. If its condition threatens her left eye, he would have to consider removing the right eye. I have not given up hope. Dorah has proved to be resilient. There may also still be options for her left eye in the future. She has had two years of sight that she would not have had. That chance to see, even though it has been a shadowland, has helped her to make sense of the world around her and to catch up on learning skills that give her a chance to cope in the decades ahead. Next week Dorah will have more lip surgery, and the first of her milk teeth has started to wobble. When she and Margaret return to South Africa early in 2000, we hope that Dorah will start at a new school and that Margaret can join a university bridging course that will eventually give her the chance to train as an occupational therapist. For two years I have had phone calls from strangers telling me that Dorah should have been left to die. People have run away from us because they thought that Dorah was a monster. My young son was ostracised by his playmates who were no longer allowed to come to play. So many people questioned if it was right to spend so much money and so much time on one injured child. I believe it was right. I believe that Dorah's strength inspires countless others to fight lesser battles. For donations, Children of Fire International's account is held at Barclays Bank in Canterbury, Kent. Account number 90103330 sort code 20-17-92. THE cornea is like a window at the front of the eye. Light enters the eye through the cornea and passes through the lens to focus on the retina at the back of the eye. If the cornea is damaged by disease or injury, light cannot reach the retina properly. A corneal graft is carried out to try to improve the patient's sight and, in some cases, to alleviate pain. Corneas can be harvested, with relatives' permission, from people who have died. One donor can usually help two people in need of corneal grafts. Information booklets on corneal grafts available from Moorfields Eye Hospital, City Road, London EC1V 2PD. The hospital also has information on corneal donation (0171-253 3411; fax 0171-253 4696).